The One&Only Le Saint Geran has 175 rooms and suites. Exquisite taste and grand opulence seamlessly blend state-of-the-art technology within One&Only Le Saint Géran's 175 rooms and suites. The beds are covered with the finest Egyptian cotton sheets and piled high with goose down pillows. The Panoramic picture windows offer fantastic views of the ocean and the stunning bathrooms offer huge fully fitted tubs to relax and unwind after a day in the sunshine. One & Only Le Saint Géran Resort The 60-acre resort is on the Belle Mare peninsula on the north-est coast of Mauritius, bounded by a cove and a coral-sheltered bay on the other. 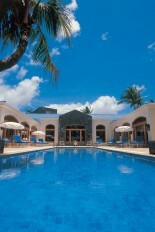 It is 50 minutes from the airport, and 45 minutes from the capital Port Louis. The One& Only - Le Saint Géran is a luxurious six star resort located in the Indian Ocean Island of Mauritius off the coast of Africa. There are many luxury hotel and spa experiences located on the island of Mauritius but the One& Only is world renowned as being one of the best, offering its discerning guests exceptional facilities, impeccable service and one of the best locations on the entire Island. Set upon the breathtaking Belle Mare Plage peninsula, One&Only Le Saint Geran overlooks a pristine sandy beach on one side of the resort and a protected flat water lagoon on the other. The long, powder soft white sand beach is what really sets Le Saint Geran apart from the others - the beach is so beautiful and so perfect that some guests choose never to leave. Spend the day lazing on your sun lounger, stirring only to raise your red flag; signaling for refreshments to be brought to your side or have a refreshing spray of Rose Water should the afternoon sun get a little too much. Each magnificently appointed room is filled with individually designed, hand crafted furniture and features a state of the art entertainment system, including Satellite TV and DVD players. A butler is on call 24 hours a day to cater to your every whim and ensure that you do not want for a thing your entire stay. The rooms are huge and are perfect for families or for couples seeking privacy and seclusion on a romantic break. The resort has some excellent dining choices as well as a Givenchy Spa, one of the only three in the world. It also has a 9 hole Gary Player designed golf course, tennis courts, fitness centre and plenty of Water sports of offer. Mauritius offers countless activities for those that can drag themselves away from The One&Only Le Saint Geran. Le Saint Geran offers guests a wide range of choice when it comes to activities. The location is perfect for water sports and the resort supplies a wonderful selection of toys for guests use. For those that prefer some pampering there is a Givenchy Spa (one of only three in the world) located on the property. Golf, fitness, horse riding, kids club or just simply relaxing by the beautiful ocean on one of the prettiest beaches on the Island, whatever you decide to the friendly staff will be on hand to help you organize your day. For more information on Amenities and Activities please see the side menu.